Pilgrims from all over the world flock to the Elephant House to romance their idol. It's on every adventuring Harry Potter fan's bucket list, a desire to be a little bit closer to Rowling's genius, wisdom and compassion, just for a moment, just for a heartbeat. Out of the window is Castle rock. JK Rowling envisaged Hogwarts as "next to a Loch, this big gothic thing set in the mountains of Scotland". Use your imagination to fill in the view. It overlooks George Heriot's school with it's 4 towers, 4 houses, and where, allegedly Rowling sent her child Jessica for a brief time. Rowling had been hounded by the press. Then one evening after school her daughter Jessica pulled her homework out of her bag and a journalist, a fellow mother, had secreted a note inside with her contact details asking for Rowling to call her. Rowling felt violated. It has espresso and hot chocolate and sticky buns as consumed by Rowling. And a special Harry Potter tipple too. It stands above Candlemaker Row (it housed candle makers), from some windows you can look out down it's length. In the gloom of winter, a little boy on a tour said it reminded him of Knockturn alley. The twisting cramped stairs leading to dark shadowy basements and the black, black doorways. There are toilets, but this is Harry Potter, these are no ordinary toilets. 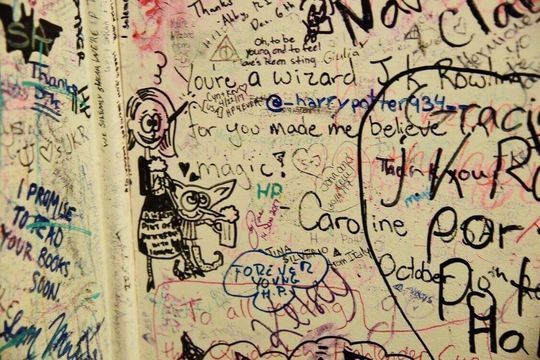 Potter fans have created a shrine to the boy who lived and the woman who gave him life. Some say that on a cold winter's day, nose bitten by the cold, a warm Elephant House cuppa thawing your hands, if you listen very very carefully, and concentrate very very hard, you can still feel the magic, and it can feel you too. It still lingers from all those years ago. If you’ve been to nearby Tom Riddle's grave, retire for a restorative hot chocolate or expresso in the Elephant House, just like Rowling. They even have a Fleur's Fantasy tipple which is just how you imagine, expensive but dreamy. If there's a queue, that's how they won that superb rating. The queue's for tables to become free, it may be a long wait. Legend has it they once gave you one of the ornamental elephants if you didn't get served within five minutes, but the cafe became depleted of pachyderms. It may be best to return near opening time or after 20.00, it closes 22.00. If you have a choice sit in the backroom overlooking the Castle. Open the drawers beneath the tables to discover a treasure of kinship. Gratitude letters from fellow fans thanking JK Rowling for years of escape and wonder. People who express gratitude experience more contentment, so grab a napkin (or better) and scribble your own. The loos are shrines of love, but they get busy. Watch the doors and wait until fans' mischief is managed. If you decide to scrap your visit and just skip to the loo, they will charge you £1. But it genuinely does all go to a local charity. The staff have seats waiting in Grimmauld Place. 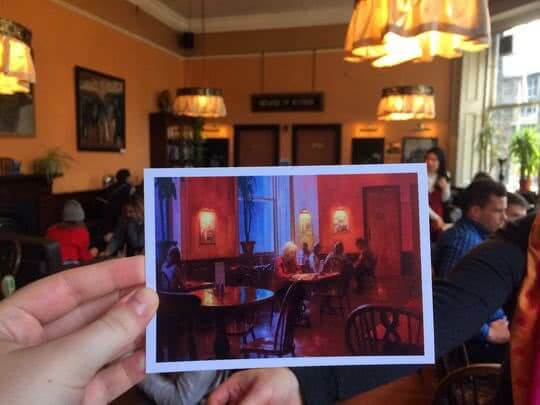 There is argument over which Edinburgh cafe is truly Harry's birthplace. Rowling appears to have written more in the Elephant House, but she wrote first in Spoon. Discover the full history of Spoon cafe & bistro. It's only 6 minutes walk away, more of a restaurant than a cafe it serves fantastic food, although arguably less atmospheric for Potter-heads. She explains why the books are a phenomenom with kids. Her mother was half French, half Scottish. Rowling is quarter Scottish (& has now lived here longer than anywhere else). After sneeking off from offices lunches to scribble for an hour and being asked by colleagues if she was having an affair. She filled draws with half finished novels. Rowling endured years of failure and self doubt, emptiness and hardship, you can see the delight at her fortune cautiously bubbling upon her face. And her determination to forever and always be a writer "until I lose my marbles". She writes neatly on plain paper, no lines. Good for doodles. It's before the movies get made & she's blown her cynical publisher away with her success and won awards voted for by children. But what she most loves is saying 'I'm big in Finland'. 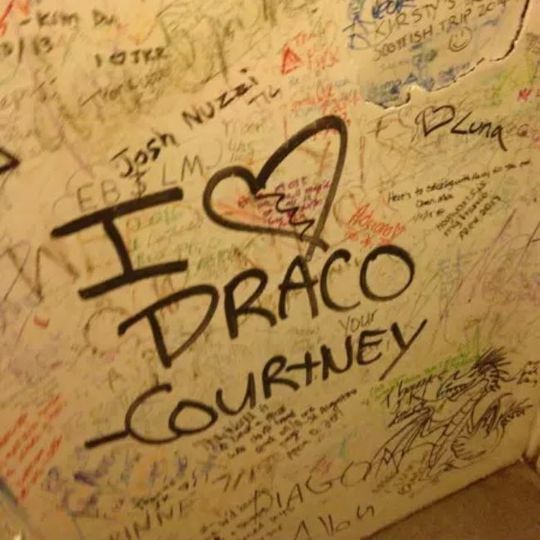 It’s begun to grow dim in the gents toilets, peoples' love for JK Rowling is beginning to blot out the light. Every surface is now so full of puns, quotes and gratitude that visitors have given up with the walls and begun writing on the windows. Staff have spent many late evenings painting the walls with rollers but have now conceded it is a waste of time. 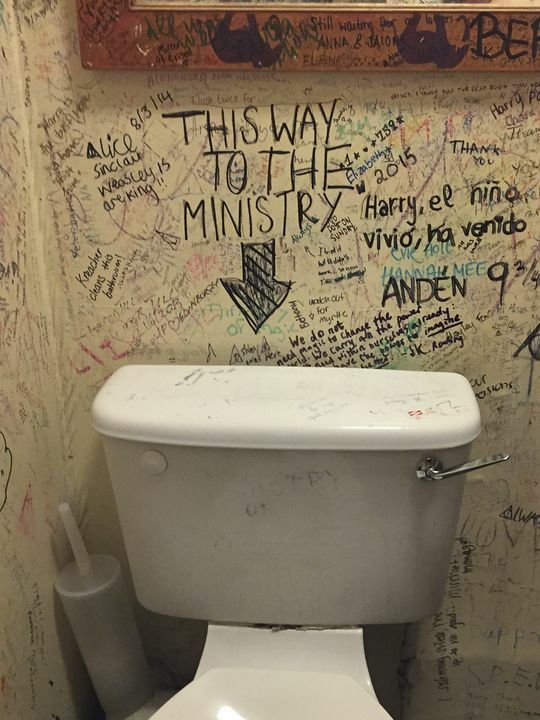 Bewitched pilgrims from all over the world come and leave messages, cramming every inch of the women’s loos too, ranging from expressions of devotion: “You taught me how to read, love and believe, thank you JK always“ to the risque “Tick here if I can Slytherin to your bed”. Toilets seats are having to be constantly replaced as they crack and break from die hard fans standing on them to reach clear writing space on the ceiling. Asked if the pilgrims are then transported to the ministry of magic, the manager said ‘No, they just get wet feet’. When Rowling first arrived in Edinburgh she experimented with various cafes, and by trial and error found the ones who’d permit her to sip a single cup of espresso for a couple of hours and write. I remember not eating so my daughter would eat. I remember nights when there was literally no money, when I had one Rich Tea biscuit and that was dinner... To think of money running out with your child not being able to eat is terrifying. 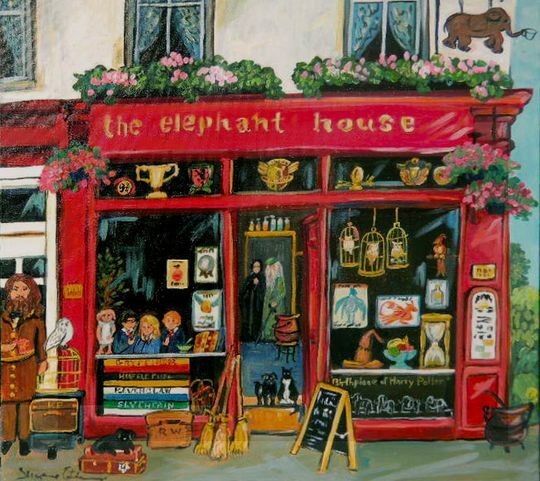 After the Philosopher's Stone was released her fame made her feel self conscious writing in her beloved Nicholsons and she discovered this house of pachyderms. And they seeped into the saga, she wrote part of the Prisoner Of Azkaban in the cafe. One of the portrait’s on the 7th floor of Hogwarts is an Elephant. When Sirius Black slashes the portrait of the fat lady in the movie the Elephant is amongst those shocked. The messages cover the sinks, hair dryers, sanitary bins and hand wash dispensers. The mirrors and frosted glass. The menus are translated to Chinese and many of the messages left are in foreign languages, “Chris from Ecuador loves Harry”, while in red pen “Thanks for the sage. Love Argentina”. Saga? Or Dumbledore? What Rowling thinks she put in Dumbledore's mouth, his wisdom is hers, and I too am grateful. “We used to paint them at the end of every Fringe festival, but I don’t think we’ve painted them for three years. Roxy added: “We try to get rid of it from the mirrors. We’ve had toilet seats broken because people have been trying to write things on the ceiling. What would Rowling write? ‘Dumbledore is gay’? Can't believe it? 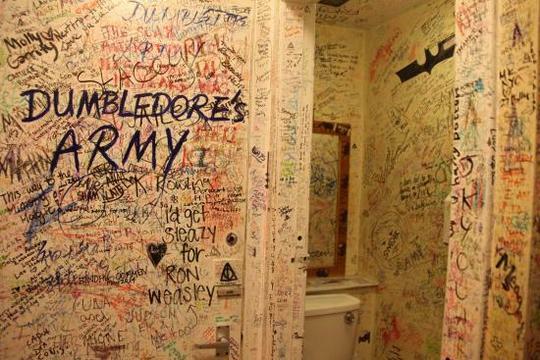 The cafe receives complaints from Muggles over the state of their loos. Well, that's not true. There is one place I would avoid: I no longer write in cafes, I can't do that anymore. And I know people might think, 'Well, very small price to pay.' But to me it's a real privation, because it was the way I worked best. Very occasionally, as a treat, I take my notebook and go off to places that I'm not known to write in, and I write there. Perhaps late one cold, foggy night Rowling will return and witness our messages. She’s said the fandom is one of the greatest joys and privileges of her life, and she remains amongst us, writing feverishly, as always. But I dunno... she likes nice things. What would Rowling really think of it all? Is it a shrine? Is it a squat? I suspect our fabulous Queen would feel it was the later. But a rather wonderful one at that. How old is Harry Potter now? Tell me, boy, does anything penetrate that thick skull of yours? Once again you astonish me with your gifts Potter. Gifts mere mortals could only dream of possessing. How grand it must be to live your whole life a stranger to your own age. Draco (whispers): Stupid sack of dragon dung. Severus: Malfoy this is my class, 50 points from Gryffindor for provocation. What is Vernon Dursley's job? The mind is a complex and many-layered thing, Potter – or at least, most minds are. Ah a Scot we are blessed. Draco: "Apparently they’ve got a special ward for people whose brains have been addled by magic. Do you want me to show you the way?" Severus: Malfoy last time I checked I'm the appointed professor. Who did Hermoine first kiss? Draco (sniffs the air): I smell a creature of dirt. Severus: Potter, Weasley in your seats now! This is a school, we are here to learn, not play at being the Ministry. 50 points from Gryffindor, and we eagerly await the next Troll footed outburst of Mr Potter. It's like your whole life isn't it Weasley? Pointless. Tut, tut, mop your cheeks, no need to cry over spilt potion. What do you pay Owls with? It's like watching Weasley's owl approach the great hall, though it tries valiantly it repeatedly flattens itself against the windows. But somehow, sometimes it gets through. You push knuts into a leather bag tied to their leg, & pretty quick, or expect a peck. Idiot boy! 6 years of magical education and what have we discovered Longbottom? You can't educate an ape. Draco: Even Dobby wouldn’t touch your socks! Severus: Now, now, Draco, this is the finest & most historied institution of witchcraft and wizardry in Europe. It is our duty to conduct ourselves suitably. 10 points to Slytherin. What position does Ginny play in Quidditch? Ah another lamentable contribution from the dimest candle in the Great Hall. Draco (whispers): You know what you remind me of Potter? A blast ended Skrewt. The blasted end. If I cut you in half will you crawl away in different directions? Severus: Now now Draco, don't spoil Potter's fine moment of glory. He has the rest of his life to spend tragically wrong. He's mental! Just remember: Always. Not booked a tour yet? Learn some dark magic in the Dark Lord's quiz & banish the wait. If you've finished your refreshment, 4 minutes walk away is a grave of a distant relative of Professor Minerva McGonagall, a visit is mandatory for all Gryffindors. He is of course outside Hogwarts. The grave of He Who Shall Not Be Named. 4 minutes walk. Shhh. Or discover the full history of Spoon cafe & bistro, only 6 minutes walk away. While Rowling appears to have written less at Spoon, she wrote first there. Although it has since changed ownership and name. Victoria Street, an inspiration for Diagon Alley, is 3 minutes walk. Kirsty Stewart's brilliant Toilet story, thankyou. 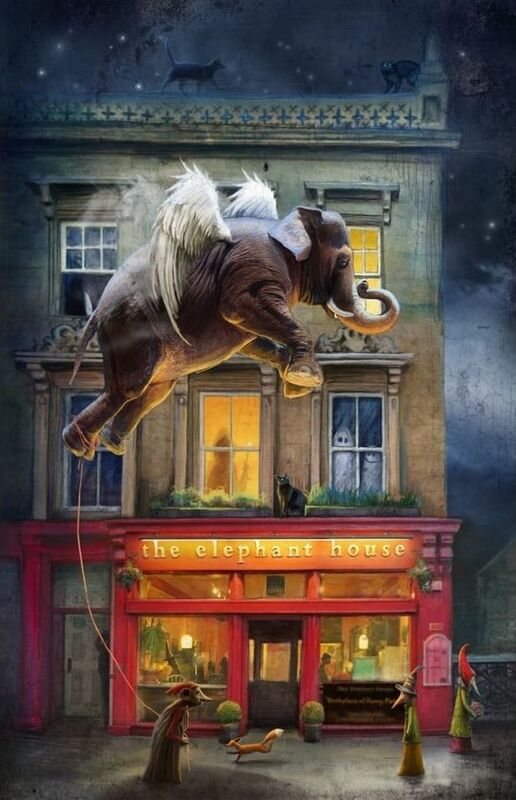 (top) Matylda Konecka's whimsical Elephant house painting; she brings delight into the world.